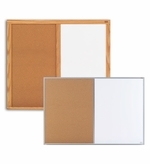 Classroom cork whiteboards and classic combination boards give you multiple surfaces on one board such as whiteboard and cork or a colored chalkboard beside a cork bulletin board. 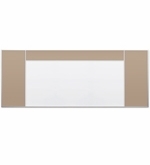 The classroom style combination units are found in classrooms across the country as one of the most popular styles of boards or writing surfaces. Combination units can also be the perfect solution when you need different applications but have limited space. 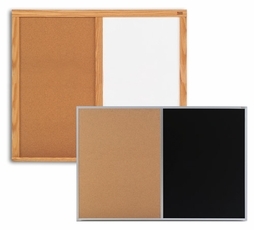 We offer classic type cork whiteboards with a natural tan cork surface lined up beside a colored chalkboard in either a green or black writing surface as well as a white magnetic or non-magnetic dry erase writing surface. The choice really depends upon how you're going to use the board and where is it going. If you are a restaurant or putting the unit into your own kitchen then maybe the classic chalkboard is a better choice but if you're a busy enterprise then perhaps whiteboard would be the better choice. We have a series of classroom style combination units with four different classic combination layouts that put the tack surfaces on top, on the side or sides or a combination of all three giving you tack boards galore. 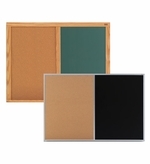 We call this the classroom series but it is also used in a number of business, healthcare or military type applications. 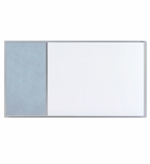 The writing surfaces are only our finest porcelain steel, magnetic receptive panels that carry a 50 year warranty. 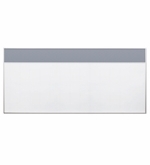 The tack surfaces come in your choice of twelve stunning vinyl coverings that are sturdy and washable. 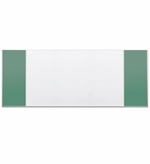 Magnetic White dry erase writing surfaces. Oak or Aluminum trims. 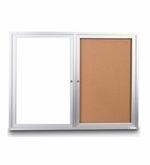 Indoor and Outdoor Approved Combination Cabinets. 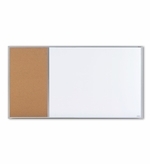 Magnetic Whiteboard and Cork Board.